Apart from the sweet taste of pineapple juice, they also offer health benefits to as many of us that drink them, of which most of them are quite amazing and wonderful to know. In this post, we shall be looking at 10 of them and i am quite sure that after reading through and acquiring the knowledge about some of them, definitely you will never go a while week without drinking the juice made from this super fruit. Pineapples can be used in many different ways, for example they can be eaten raw, they can be cooked and also they can be an ingredient in other fruit juices. The leaves of pineapple is also preserved in used in art making. Pineapple is a popular tropical fruit, they are readily available in most season of the year, and the most important thing is that the health benefits derived from just drinking a pineapple fruit juice can never be underestimated. Pineapple has been typically known to originate from Hawaii, but it can also be found in most countries in the world such as Nigeria, Brazil, Philippines, Costa Rica etc. Pineapples are actually native to Brazil and Paraguay and was introduced to Spain and the other parts of Europe by Christopher Columbus. Before we shall be looking in details the various health benefits of pineapple juice, i will like to first of all congratulate as many that have made the drinking of this juice a habit, because ir have a lot in stock for your health. Now, let us look at some of them. Pineapple is a fruit that is digest very easily and they do not result in bloating or gas. They also contain high fibre content, which is very essential for proper digestion as well. In a study conducted in animal, a key component of pineapple was discovered, which helps to treat digestive disorders buy reducing gut inflammation and also preventing diarrhoea. This component also helps in the breakdown of proteins, helping digestion. Whenever the word "healthy bones" comes up, the first nutrient that comes to the mind is calcium. Many do not know that manganese is also a nutrient that plays a vital role in our bone health. 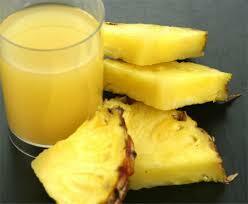 Pineapple juice contains plenty of manganese, which helps in ensuring that your bones stay strong and healthy. Pineapple juice also contains lots of antioxidants which helps in keeping the teeth to be strong and prevents plaque build-up by restricting the activities of bacteria. This bacteria reduction also helps to prevent gingivitis and periodontal disease. Pineapple juice aids in the reduction of blood pressure, because it contains high amounts of potassium and also helps in lowering the quantities of sodium in the blood. Pineapple juice contains similar powerful antioxidants found in carrots which promotes healthy vision, and recent studies have discovered that drinking pineapple juice on a daily basis can help to prevent the onset of age-related macular degeneration. Pineapple juice contains a large amount of vitamin C, which is known as a powerful immune booster. Antioxidants that are present in pineapple juice can also prevent the damage caused by free radicals that are capable of harming cells and speed up the aging process, or might eventually lead to illness. Inclusively, the components found in pineapple juice are natural anti-inflammatory agents, that fight against sprains, tendinitis, strains, and other muscle injuries. The same components have also been discovered to be useful in fighting gut inflammation and arthritis-related inflammation. Pineapple juice have been proven to improve blood circulation, thin the blood (which can reduce the risk of heart attack and stroke), and helps in lowering the risk of heart diseases. All these are credited the antioxidants found in pineapple which fights against free radicals in the body system. As mentioned earlier, that pineapple is capable of preventing age-related macular degeneration, it can also work to protect the eyes against cataracts as well. The antioxidants present in pineapple can help in lowering the risk of developing cataract, which is a condition that makes the lens to become foggy and interfere with proper vision. Pineapple juice contains a lot of essential vitamins, nutrients and minerals that have been proven to aid in boosting the fertility of both men and women. Just like most fruits, pineapple also aid in weight loss because they are rich in nutrients and do not contain artificial sugars and unhealthy fats. Pineapples or pineapple juice can be consumed on a daily basis in order to keep you satisfied, full and also offer a lot of health benefits.